Our homepage is long, please be sure to scroll! Thanks! If you are looking for Quality Crystal jewelry, then you've come to the right site! All of my jewelry is made from Genuine Swarovski Crystals, top quality furnace glass beads, and Bali Beads with Sterling Silver clasps. Most of my jewelry is created using 6mm and 8mm bicone crystals and 4mm or 6mm cube crystals. Click Here to visit my Store to buy the bracelets with PayPal directly from the site! Please click below to see some of my examples. Clear, Jet, Siam, Lt Rose, Emerald, Rose, Tanzanite, Peridot, Lt Sapphire, Sapphire, and Violet. I can order any colors on the following color chart. Payment methods I accept are Check (out of state checks will need to clear before items are shipped), Money Orders, and PayPal. PayPal is my preferred method of payment, and it's also the quickest. 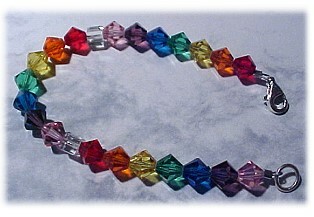 Children's bracelets can mirror adult bracelets, only using smaller beads. 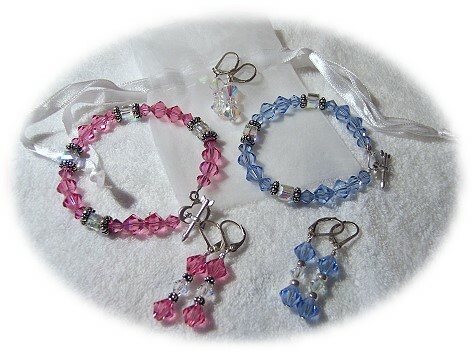 I recommend the Alexandra, Avery, or Ellen styles for children's bracelets as they are made using smaller Bali beads. I use 6mm bicones and 4mm cubes on the children's bracelets and they will have a small lobster clasp. Please specify when ordering that the bracelet is for a child, and be sure to measure the child's wrist to get a more accurate fit. New!!! 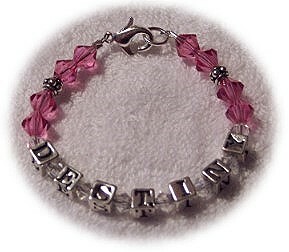 Name Bracelets....$20.00 for Children's Sizes. To order, please fill out Custom request form. Put Name Bracelet in ID. Don't forget size and color...and name of child or baby! Custom orders are welcomed! It is our goal to make your jewelry perfect for your occasion! When custom ordering, please email me and I will reply as soon as possible and we can work together to make sure that your order is just as you imagine. Are you getting married? Looking for your bridal parties' special jewelry? Wouldn't it be nice to find something that matched their dresses? Look no further! We've got lots of colors, and I am sure that you'll be able to find crystals that will match the dresses perfectly! If you email us and tell us the color of your dresses, we can help you find that perfect bracelet, necklace or pair of earrings (or all three!) that your girls can wear for your special day! Or maybe you as the Bride would like something special that matches your dress? We can arrange that for you as well. Just have a look around, and if you like what you see, send us a quick email and we can work together to help make your day even more special! 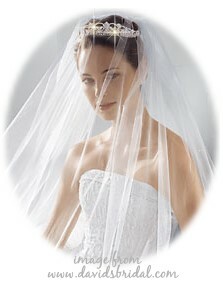 We have special discounted rates for bridal party orders. Wedding gift baskets that will make them smile. Jewelry listing, jewelry stores, find jewelry, discount jewelry, diamond jewelry, gold jewelry, wedding jewelry, wholesale jewelry, gemstone jewelry, and much more! UYA returns to nature for balancing body, mind and spirit. We offer therapeudic essential oils and carrier oils at affordable prices. Please email if there are questions or concerns. Most graphics ©Heidi Web Creations.